Disarmament Insight: What do survivors think of cluster munitions? What do survivors think of cluster munitions? When is it acceptable to harm civilians? Did you ever wonder what a cluster munition survivor thinks of cluster munitions? We found out a few weeks ago during training in Belgrade, Serbia, for individuals from communities affected by cluster munitions in Afghanistan, Lebanon, Serbia and Tajikistan. Their answers were stunning, and touched on devastation, the death of parents and relatives, babies torn apart, terror, trauma, blindness, horror and poverty. There was also guilt and uncertainty - why am I the only survivor of the family? Why did ‘they’ kill my little brother, my mother, even our sheep? What should I do now? And, what do I have to live for, since cluster munitions have killed my family and neighbours? Over two days, my colleagues Patrizia, Jelena, Firoz, Loren and I heard these moving stories from a small group of rather amazing people. We expected something strong to come out of the meeting but were not prepared for something as strong as that. The main goal of this pilot project is to enable individuals from affected communities to take part and influence the Oslo process to address the humanitarian impacts of cluster munitions in a way that responds to affected communities’ needs. The project is born out of research on the human impact of cluster munitions that my organization, Handicap International, and our research partners conducted over the past two years (see Fatal Footprint and Circle of Impact, our two reports on the global human impact of cluster munitions). 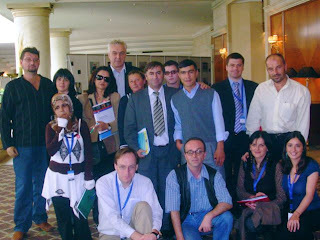 Beyond research into the impacts on the ground, we felt that there was a need to involve in the diplomatic process those people for which the Oslo process has been developed, in partnership with other NGO’s active in survivor and cluster munitions issues. In fact, you could see this project as a global community liaison project, establishing a two-way communication between affected communities and the diplomatic community. After a few days of training the participants - Snezana, Sladjan and his wife Dusica, Umarbek, Dejan, Danijel, Milosav, Rasha, Ali and Jonuz - had become Ban Advocates, meaning that we’ll work together over the course of the coming year to explain to diplomats, military and the media why the Oslo process on cluster munitions is so necessary and how it should address affected communities’ needs. More than us, they know what a cluster munition is and why it should be banned. They know what the ‘victims’ needs are. And beyond the theoretical discussions that often take place in multilateral talks, they know what is needed in their communities and can inject a much-needed sense of reality. And they have already begun to do this, for instance at an international conference of cluster munition-affected states in Serbia earlier this month. If you come to Vienna, Wellington or Dublin for the next international meetings of the Oslo process, you’re likely to meet these Ban Advocates. Please, listen to them. If you do, what they shall tell you is likely to radically modify your understanding of what a cluster munition is and what its effects are. The Ban Advocates initiative will be launched officially just before the Vienna Conference on Cluster Munitions in December this year. This is a guest blog by Stan Brabant. Stan is Head of Policy at Handicap International, Belgium, and coordinates the ‘Ban Advocates initiative’. Photo of the Ban Advocates in Belgrade courtesy of Stan Brabant (front row left).